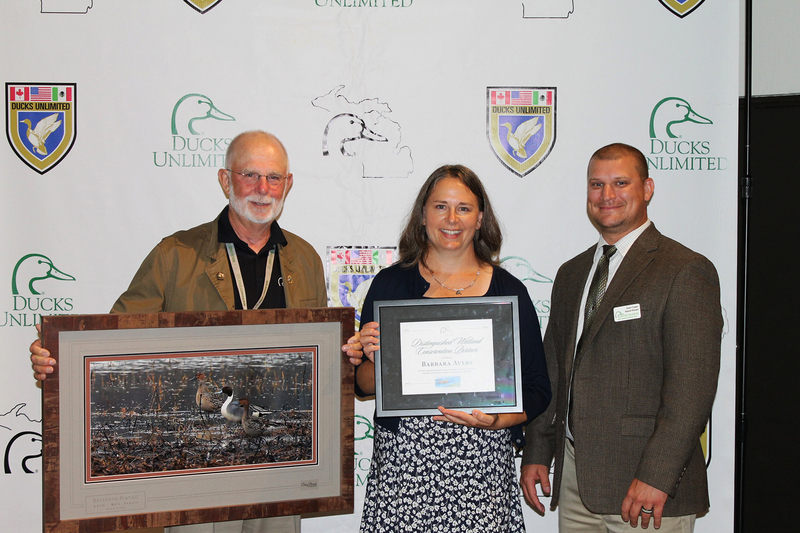 Department of Natural Resources waterfowl and wetlands specialist Barbara Avers recently received the first-ever Michigan Ducks Unlimited Conservation Partner of the Year Award. This award was given on behalf of all the members and volunteers of Michigan Ducks Unlimited for Avers’ long-time work on wetland habitat and conservation throughout the state and in the Mississippi Flyway. Ducks Unlimited regional biologist Dane Cramer nominated her for the award because of her dedication to wetlands and waterfowl. Avers was surprised and pleased to receive the award. DNR Wildlife Division Chief Russ Mason applauded Avers’ dedication. An accompanying photo is available for download below. Caption information follows. Avers award: Pictured, left to right: Ducks Unlimited volunteer public policy chair Steve Wyckoff, DNR waterfowl and wetlands specialist Barbara Avers and Ducks Unlimited regional biologist Dane Cramer.